I am sorry to say that I got so into the project that I completely forgot to take photos of it before, but trust me...it was "ugly." This is one of the old wood shelves as I started the project. 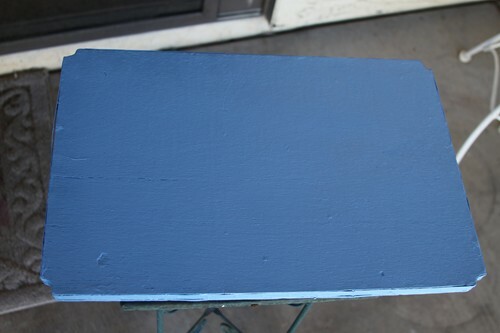 I began by cleaning it off and then painting both sides of each shelf blue. I just used acrylic paint because that is what I had on hand. 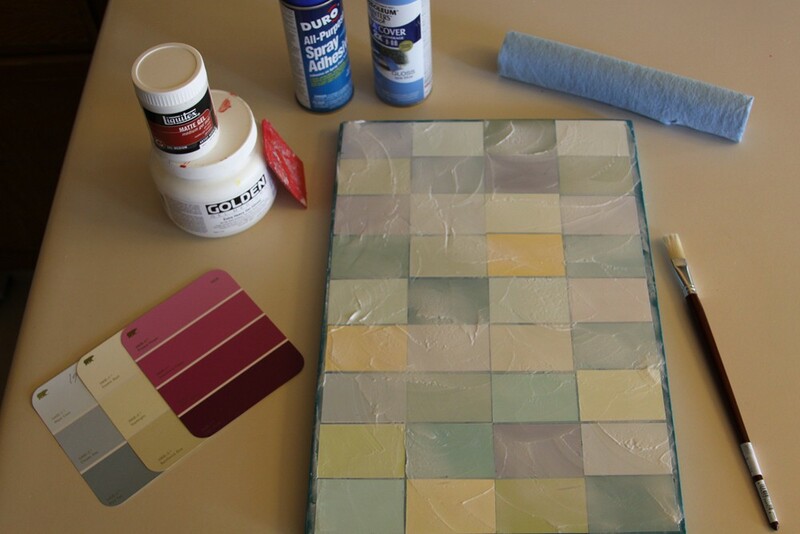 I also collected up all of my paint chips that I had that were in the light blue, green, violets and soft yellows. 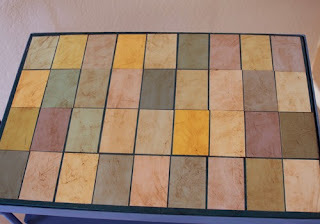 I measured my "paint chips" into 2" x 3" pieces and cropped each one with an Xacto knife. 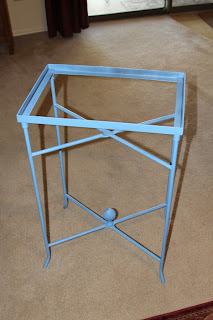 Then I went outside and spray painted the rod iron frame of my table with gloss enamel from Home Depot. Then I laid out all of my supplies and decided where each square of color would be placed on the top shelf of my table. I spray glued each square "paint chip" one by one and positioned it on my table top. I left just a small space between each "paint chip" to give it a little bit of a mosaic look. Once dry, I coated the top with 2 coats of Liquitex acrylic matte medium, then two coats of Golden Extra Heavy Gel Gloss. These are the supplies I had on hand, so I used them. 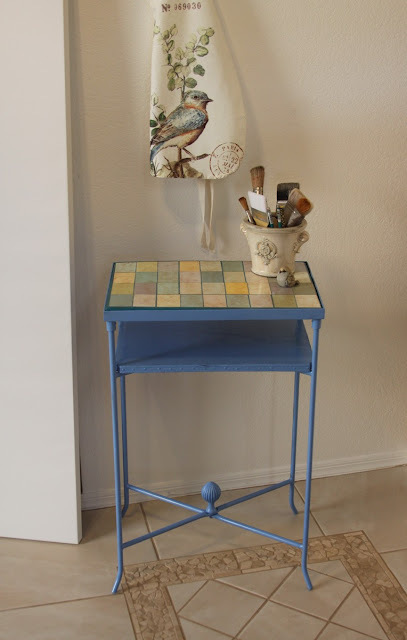 The idea I saw on the "Addicted to Decorating" blog post used something called Modge Podge, which I didn't have. So I just used what I already had in my art studio, but be sure and let each layer dry completely in between layers. 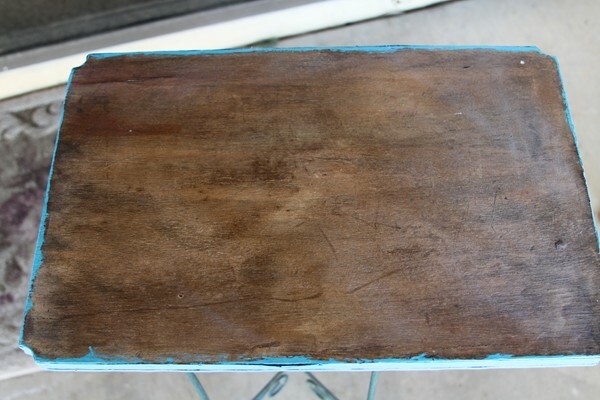 I hand rubbed in a wash of "raw umber" acrylic over the top of my table to create a little distressed and antique look. Once dry, I varnished it with a satin varnish. Then I placed my shelves into the table frame and now it is "Finished!" I would love to hear your comments too. Just click on the comment link to leave your message. And her post idea came from "Hope Studios"
The table looks fabulous. So unique and functional too. Great idea and it didn't take a lot of time overall. I love this! I may borrow the idea! You should try it out Pam, it is so easy. The only thing I would do differently is just use matte medium instead of the gloss. 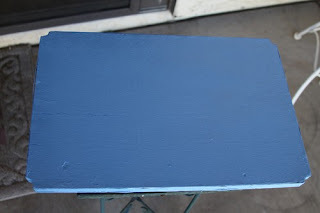 If you want to leave the colors brighter too than you can just skip the staining part over the paint chips and just varnish it. Thanks for leaving the comment too. I love it. You'll have no problem branching out to other forms of art, or allow me to adopt you, as there are many such projects in my house... The range of your talent is astounding!